Infrared non-contact thermometer to accurately measure a person's body temperature, with coloured LED read-out and fever alert. Instantly check if a person under your care is ill with a fever. 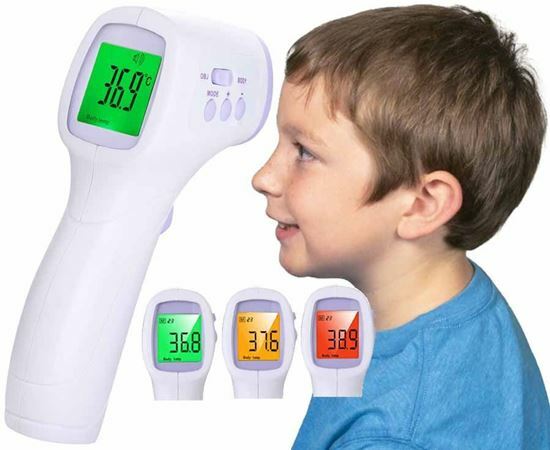 Infrared no-touch thermometer to accurately measure a person's temperature by pointing at their forehead from a distance of 5 - 15cm, with coloured LED read-out and fever alert. - Produced by a specialist world-wide thermometer manufacturing company using Japanese high grade sensor. IEC, ICC, ISO Standards certifications and RoHS/FCC approvals for medical applications and safe to use. - Non-contact minimises cross-infection and person discomfort. - Measures body temperature and surface temperatures of any object (selector switch), with dynamic off-set for ambient and body temperature. - Measures from longer distance (5 - 15cm) compared to other models/brands. - Audible/visual alert for fever and low body temperatures. - Stores 32 data readings in memory for later recall if needed. - Auto-off in 20 seconds to save battery power. Requires only 2 x AAA batteries. - Reads in celsius and fahrenheit. - Small and light-weight, only 160g. - Includes user instruction manual. For measuring a person's body temperature, it is very easy to use and very fast. Press handle button to boot and 2 short beeps will announce and display the current room/ambient temperature. If conditions, such as room temerature are not right, the device will not proceed, but it also has the ability to automatically adapt, ensuring only accurate body temperature readings once conditions are met. Point device 5 to 15 cm towards forehead of person and press grip button. Within a second, the reading will show, accompanied by the revevant back-lit colour LED screen and audible alarm for low and high body temperature alert conditions. Instantly checks if a person under your care is ill with a fever and provides that evidence for further immediate action. 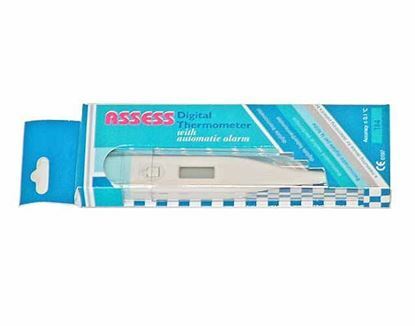 Advanced digital thermometer with integrated fever alert alarm and special beep sound when temperature reading reached. It even indicates critical low body temperature as well as critical high body temperature. Memory function. Medically certified. For use orally, in armpit or rectally. 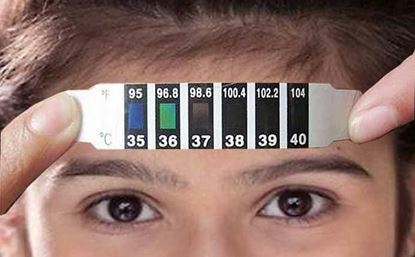 Small reusable FeverScan band displays body temperature when placed on forehead, indicating fever levels beyond 37°C.